The very first thing that you noted about Billy was not the unkempt nature of his clothing nor was it the wild red hair. It's those teeth that drew you in. Stainless steel dentures that he'd sharpen so as to tear flesh from bone with little effort. Billy Bones (true name William Francis Waznowski) became a mortician by trade after his dry goods store failed. He bore a grudge against the competition that ran him out of business but despite that animus, when members of the Fleming family shuffled off this mortal coil, he did a splendid job of making them look lifelike in their coffins. The story reporting the fire to their store after the last Fleming died didn't make it above the fold. It didn't even make the business section. It became news in the police blotter, the section immediately preceding the crossword puzzle, comics and the classifieds. Rumors of a curse or hex abounded for a season, but time erased them. Speculation at the time ran that the editor had a well founded fear of Billy Bones and he spiked the story personally. I'm not sure what to believe. Things became suspicious when neighborhood children went missing on Halloween night as they trick-or-treated on Billy's street. His house, brightly lighted, displaying pumpkins and black paper cats was a magnet for the children. He gave out full-size candy bars, not the measly treat-sized chocolate. 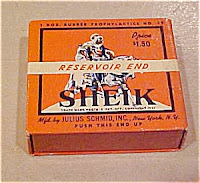 On the night, he wore his best porcelain dentures, oversized, looking more like horse teeth than human teeth. His big smile as he handed out candy assured neighbors of his sincere intentions to be part of the community. Long after neighborhood lights went out as candy supplies were depleted, Billy's stayed on, and some children went back for candy four or five times. That very open and generous conduct ruled out any possibly of foul play so far as the police were concerned. However, the mystery of the missing children remained. That he took a wife became the subject of gossip among the old biddies of the town. She had few charms, chronic halitosis and marginal hygiene, but as her age advanced, the likelihood that she would make a match faded until Billy's offer. As the wife of the undertaker, she would enjoy a certain stilted place in society. Wearing black, standing by in mourning at funerals, her yellow teeth and dull hair didn't seem so shoddy. Her body odor was completely eclipsed by the patented embalming fluid that permeated the funeral parlor. The Halloween practice that everyone had become accustomed to changed as the couple lighted the mortuary and children were invited in to accept candy from Mrs. Bones, who lay inside a coffin well into the viewing parlor of the funeral home. Full sized candy and no prohibition on repeat visits still made the place the go-to spooky place on Halloween night. It was only years later, after Billy and his wife died, that the new owner of the funeral parlor found that the Butterfingers were actually buttered fingers, draped in chocolate and that the Baby Ruth bars were made from real babies, purchased in bulk with a discount rate from Planned Parenthood. The Snickers were handed out for shits and giggles. A curse or magic spell, which faded following the death of those who cast it, made the young believe that they were eating genuine candy. 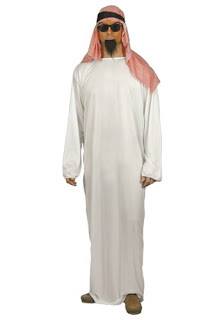 If your tablecloth is worn, you can go as an Arab. If you have an old, torn sheet, you can go as an Arab (or a ghost). Same outfit except you keep the front of the sheet open if you're an Arab. Any of these outfits plus a few road flares and duct tape makes you a mad bomber. Stay in character and chant "Death to America" as you're jonesing for free candy. I've been told that trimmed (and glued) pubic hair makes a great Arab beard. I have no experience with this, you have to try it out for yourself. 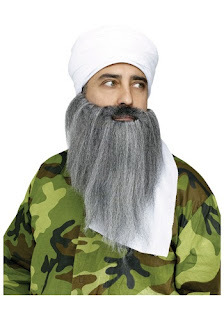 For those of you who have a few bucks burning a hole in your pocket, you can buy a fake beard (left) at a novelty shop, wrap a towel around your head and wear an old BDU and you can go trick-or-treating as Osama bin Laden. 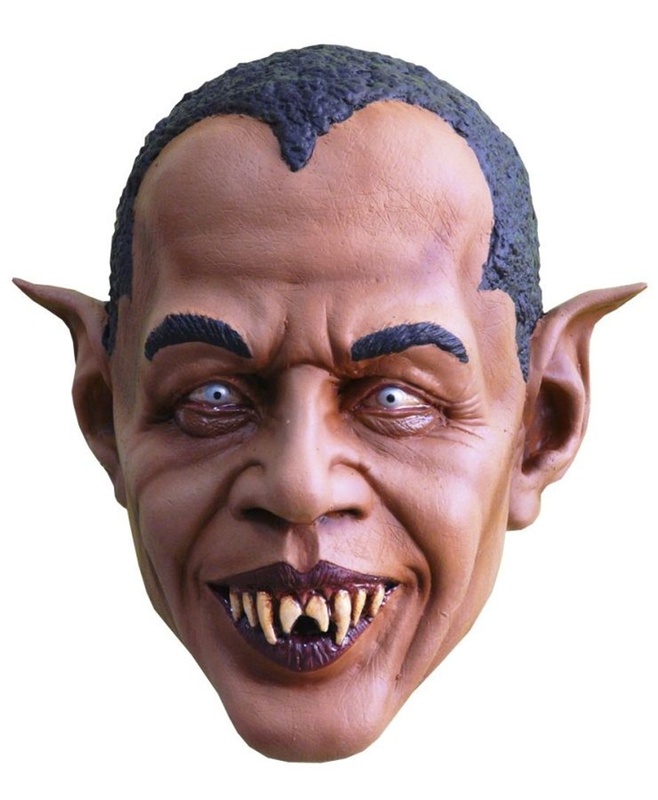 I've been told that blending any of the above with a Barack Obama mask is in bad taste, which says to me: "Try it!" 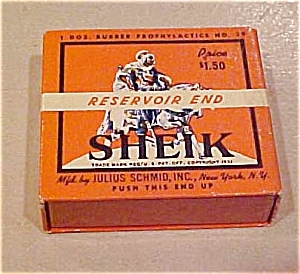 If you're going as a sheik, it might be a good idea to stock on condoms to hand out at the party. Isn't that what sheiks do? The Burka costume is going to be a big hit this year. 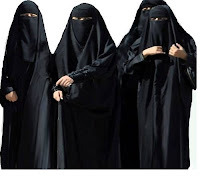 If you can't afford the $35.00 price tag, dye a sheet black and cut a slit instead of eye-holes (the difference between a black ghost and traditional Muslim female clothing). If you're wearing a Burka, you need to make sure that you walk three steps behind the sheik-sheik and give all of your candy to him. He will decide how much of it to give back to you. If you and all of your friends go trick or treating in hijab, get together and take a group photo - for the memories. 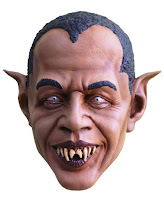 There is also the Baracula mask for those of you who want to represent the POTUS as a vampire. It's not politically correct because we wouldn't want to mock the 'leader of the free world', would we? If you are going as a couple, may I suggest a Star Wars Wookie outfit for the lady? If you're going as Hillary (pants suit, portly belly) and Huma, make sure to wear comfortable shoes to complete the ensemble. 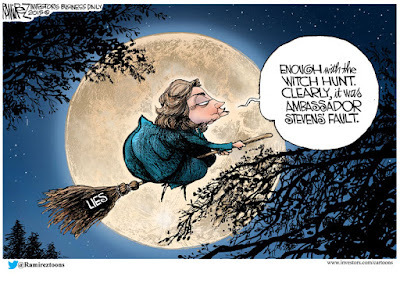 Bring a broom and be prepared to ride side-saddle if you're Huma. Hillary will straddle that bad boy.